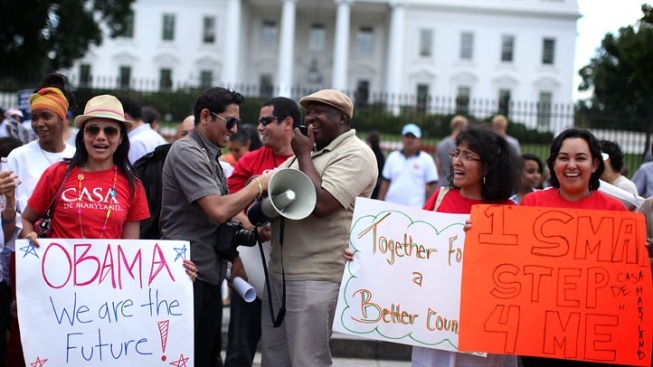 Members of CASA de Maryland gather in front of the White House to celebrate the Obama Administration's announcement about deportation of illegal immigrants June 15, 2012 in Washington, DC. Obama said the administration will stop deporting undocumented immigrants who had come to the U.S. when they were at a young age. Immigration experts encouraged undocumented San Francisco youth on Wednesday to prepare for next week when they will be able to apply for deferred deportation. The policy change, announced by President Obama in June, provides a two-year deferral of deportation for people who came to the U.S. before the age of 16, are under 31 years old, and meet other requirements. The first day to apply for the policy is Aug. 15, and members of the San Francisco Immigrant Legal and Education Network (SFILEN), the coalition that held Wednesday's news conference, encouraged people to prepare ahead of time. "Start obtaining documentation, school records, medical records, anything with a name and dates," said Laura Sanchez, an immigration attorney with the Central American Resource Center (CARECEN), a group in the coalition. Other eligibility requirements include having resided continuously in the U.S. since June 15, 2007, currently being in school or having obtained a high school diploma, and having not been convicted of a felony offense or a significant misdemeanor. Sanchez said another critical thing to be aware of for immigrants seeking deferred deportation is the $465 application fee. "It's a significant amount of money," she said. "Imagine having multiple family members who may qualify." Anoop Prasad, an immigration attorney with the Asian Law Caucus, said many people are wary of applying because they believe it could put their undocumented family members who are not eligible for the program at risk. Prasad said that is not the case. "Privacy act privileges are in place," Prasad said. He said some are also waiting until after the November presidential election to apply since a new president could alter or dismantle the policy. Sanchez said people interested in applying should consult with a nonprofit agency that is part of SFILEN or an experienced immigration attorney because "it's somewhat of a complicated process," and said an application form has still yet to be released by federal officials. She also warned against "notarios," people posing as immigration attorneys or consultants. Emmanuel Valenciano, a 24-year-old San Francisco State University student, said he is an example of an undocumented immigrant who plans on applying for the policy. Valenciano said he was moved to the U.S. from the Philippines at the age of 13. "At that time, I did not know the consequences of staying here," he said. "I was afraid of the future, and didn't know if my status would be fixed." Valenciano said "it was amazing" when he heard of the new policy, but said "it's only a temporary" fix for undocumented youth. "There are hard workers still living in the shadows," he said. For more information on the deferred action process, visit the U.S. Citizenship and Immigration Services website at www.uscis.gov.